Do you work downtown or will be in the area for lunchtime this week? Looking for a way to celebrate St. Patrick’s Day this week without so much as touching a green beer? Now there’s another reason to stop by the notoriously delicious Mendocino Farms for your mid-day refueling. Chef and partner Betty Han has put together the Irish Stew Lamb Sandwich in honor of the luck ‘o the Irish. For a limited time – just this week, in fact – you’ll be able to order this St. Patrick’s Day celebratory special and satisfy your braised lamb craving all in one fell swoop. 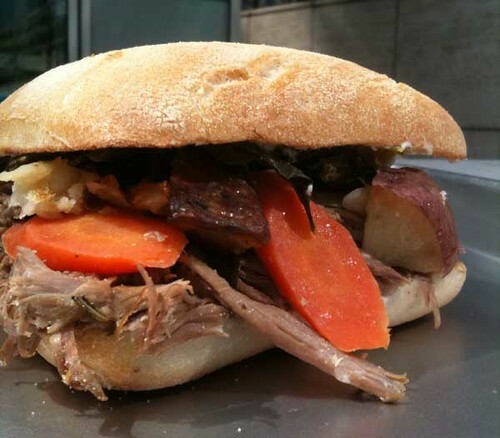 In the sandwich is Braised Lamb Shoulder, Cider-Glazed Carrots and Parsnips, Roasted Potatoes and SautÃ©ed Collard Greens – complete with a Horseradish Crema and Lamb Au Jus. The price is consistent with all of Mendocino Farms’ other divine sammiches: $9.25. So head on over during the day; the Irish in you – and your tastebuds – demand it! This entry was posted in Downtown LA, Food and tagged downtown los angeles, DTLA, Irish stew lamb sandwich, L.A., lamb, los angeles, Mendocino Farms. Bookmark the permalink.